Scale: The northern rise is about 950 km (590 mi.) across. Of Interest: Volcanic smooth plains cover a large portion of Mercury's high northern latitudes. The plains are interrupted by a broad elevated area that rises about 1.5 km (1 mile) above the surroundings. The image presented here is part of the MDIS monochrome basemap that has been color-coded by elevation, with blue representing lower elevation and red representing high elevation. The northern rise, shown in the green and yellow colors (with a hint of red at its highest locations), appears to have formed after the plains were emplaced. The mechanism responsible for the uplift is not yet established; ideas include lithospheric deformation, magmatic intrusion, or mantle dynamic uplift. 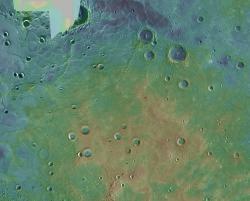 This mosaic was acquired as part of MDIS's high-resolution surface morphology base map. The surface morphology base map covers more than 90% of Mercury's surface with an average resolution of 250 meters/pixel (0.16 miles/pixel or 820 feet/pixel). Images acquired for the surface morphology base map typically have off-vertical Sun angles (i.e., high incidence angles) and visible shadows so as to reveal clearly the topographic form of geologic features. The MESSENGER spacecraft is the first ever to orbit the planet Mercury, and the spacecraft's seven scientific instruments and radio science investigation are unraveling the history and evolution of the Solar System's innermost planet. Visit the Why Mercury? section of this website to learn more about the key science questions that the MESSENGER mission is addressing. During the one-year primary mission, MESSENGER acquired 88,746 images and extensive other data sets. MESSENGER is now in a yearlong extended mission, during which plans call for the acquisition of more than 80,000 additional images to support MESSENGER's science goals.